Heavy-Duty trash receptacles ready to be the industrial strength solution for any 32 gallon and 55 gallon recycled plastic trash collection needs. 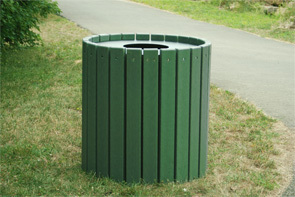 The super strong recycled plastic slats are available in the Resinwood color options of cedar, green and gray. Optional rugged plastic liners are available.